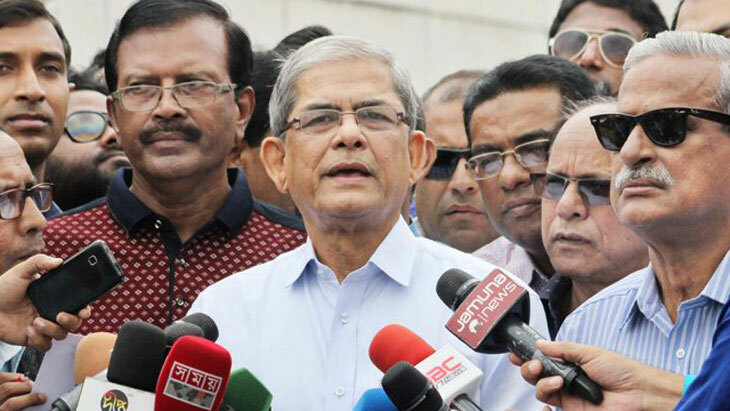 BNP secretary general Mirza Fakhrul Islam Alamgir on Sunday alleged that the ruling party is trying to turn the national election into a farce through its repressive acts in the month of Victory Day, UNB reports. “The national election was announced to be held in the month of victory. But, the government has unleashed serious repressive acts on the opposition leaders and activists to turn the election into a farce,” he said. The BNP leader came up with the remarks while talking to reporters after placing wreaths at the National Mausoleum in Savar at 9:10am. Fakhrul together with party leaders and activists paid homage to the martyrs of the Liberation War by placing wreaths at the National Memorial, marking the 48th Victory Day of the country. He said the opposition leaders and activists are being attacked with guns destroying the election atmosphere. The BNP leader alleged that though the government is repressing its opponents, the Election Commission cannot play any role in containing it, manifesting its incompetence. Fakhrul said they have been on a movement to restore democracy and free their chairperson Khaleda Zia from jail, and it will continue it until they succeed. “Establishing democracy was the main spirit of the Liberation War. We’re now carrying out a movement to restore democracy and democratic rights,” he added. BNP standing committee member Nazrul Islam said people have started putting up resistance against repressive acts of the ruling party. He said people will ensure the victory of Jatiya Oikya Front and the 20-Party on December 30 foiling all the 'evil' efforts of the government.